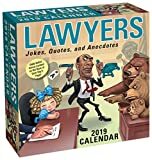 The Lawyers: Jokes, Quotes, and Anecdotes calendar has been a perennial favorite of attorneys, judges, law students, and anyone connected to the legal profession. Each daily page of the Lawyers 2019 Day-to-Day Calendar offers a much-needed laugh, with hilarious jokes, humorous quotes, outrageous lawsuits, and unbelievable-but-true courtroom records. Judge for yourself: You're sure to find this all-new calendar hilarious as charged. 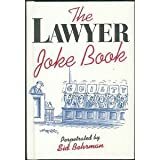 Finally, a lawyer joke book created with lawyers in mind! This 101 Lawyer Jokes for Lawyers book is full of funny, humorous wisecracks that apply only to lawyers and the legal profession. You won't find "God doesn't think he's a lawyer" jokes here. These jokes poke fun at clients, the courtroom, litigation, judges and law school but still pays respect to the profession that advises people in legal matters. You'll find yourself arrested in laughter as you read through 101 Lawyer Jokes for Lawyers. Get a copy for yourself or for a lawyer with a good sense of humor! What do you call 600 lawyers at the bottom of the sea? Marc Galanter calls it an opportunity to investigate the meanings of a rich and time-honored genre of American humor: lawyer jokes. Lowering the Bar analyzes hundreds of jokes from Mark Twain classics to contemporary anecdotes about Dan Quayle, Johnnie Cochran, and Kenneth Starr. Drawing on representations of law and lawyers in the mass media, political discourse, and public opinion surveys, Galanter finds that the increasing reliance on law has coexisted uneasily with anxiety about the “legalization” of society. Informative and always entertaining, his book explores the tensions between Americans’ deep-seated belief in the law and their ambivalence about lawyers.